The only four things I need in life to look less of a zombie. I used to take hours getting ready for the day because of my big curly hair needing maintenance but ever since I got my hair chemically straightened my mornings have been a little easier and quicker. I’ve been loving some products recently that I’d like to share with you all, they are my go-to products that I use everyday to make myself look a little more presentable because let’s be real, we don’t all wake up looking like Beyoncé. Face: Estee Lauder Double Wear Stay-In-Place Makeup with SPF 10. I’m the shade Dawn (2W1).I’ve been raving on and on about this foundation to my friends, it’s just amazing. After using drug store foundations all life once I put this foundation on I immediately noticed the difference and cannot go back. It’s just lighter, less “foundationy” once it’s on and looks absolutely flawless – I don’t have to use concealer anymore! Eyes & Eyebrows: Dipbrow Pomade by Anastasia Beverly Hills. I’m using the colour Chocolate.I use this for both my eyebrows and as my eyeliner, using the Ardell Duo Brow Brush. Unfortunately, I wasn’t naturally blessed with beautifully shaped, full-looking eyebrows so I need a little help! I used to use Rimmel Eyebrow pencil but it always looked too “drawn” so I opted for this gel instead: I think I can just use brushes better than pencils for instance, I can never line my eyes with pencil because it always looked so… obvious, like I can’t explain it – I feel like I get more precise lines with a brush?? Previously, I used L’Oreal black gel eyeliner but I’ve recently wanted to make my eyes look a little softer for everyday wear and so I don’t look the same during events when I really want that black, dramatic Feline Flick look. Hair: OGX Kukuí Oil Anti-Frizz Hydrating OilAdmittedly, my hair has been through a lot: hair dying from yellow, orange, dark brown, light brown, ombré, honey blonde; hair re-bonding, strain from my hair straighteners and curlers all resulting in frizzy, dry hair. I’ve been using this oil recently to try and give life back into my hair – it’s been working, I usually have very frizzy ends but this helps tame them so I don’t need to try and de-frizz them using a straightener. A little bit less of a zombie! I’m wearing a navy trench coat unknown brand, perfect for the rainy season. I have been using makeup for years now and always love the confidence boost it gives me, especially when my makeup game is on point – makes me feel a little bit like Beyoncé. I remember the dreaded times I wasn’t very good at make up (when my makeup game was off-point *sobs*) but it does take a lot of trial and error, practise and Michelle Phan tutorials to get through it, haha. What are your go-to products? Nice post, girl! Gfc is google friend connect follower widget! It’s on my sidebar under the tag ‘followers’. Hope you can find it 🙂 if you want I can follow you via different device. I’ll have a look, thanks Eva! I’ve heard such good things about that Estee Lauder foundation, really need to try it soon! Also – long time!! Didn’t know you were beauty blogging now! Hey Catherine! You should definitely try it out – worth every penny! It doesn’t come with the pump but you can get that from MAC, it just saves a lot of product. I’m not exclusively beauty blogging but I’m back in the blogosphere! You definitely need to try it, looks amazing and DOESNT MOVE! No more rubbed off eyebrows during the day 😉 Thanks Ela! I have been also been straying away from eyeliner lately for my everyday and put more emphasis on my eyelashes instead 🙂 I was never fond of pencil eyeliners tbh. I used gel for a while (Maybelline’s Lasting Drama gel liner) but I feel more satisfied with liquid pen liners. For the time being, I just put dark (not black) eyeshadow at the base of my eyelashes. Straight hair is easy to take care of! But I can’t keep mine too long, I just have too much and it’s a pain 🙁 I never used any haircare product before I dyed my hair or used any kind of irons and it was fine but now, I can’t do without heat protector! I’ve heard of that mascara, I need to try it! That foundation sounds amazing and looks so nice on you! I LOVE ARGAN OIL TOO! Feel ya girl! I love Nars All Day Luminous Weightless foundation and the Charlotte Tilbury Filmstar Bronze & Glow! I love Charlotte Tilbury’s products! I love your picks! The foundation and the brow pomade have been products I have been wanting to try for the longest time. Also, that oil is amazing! I use it everytime my hair looks frizzy and it just makes it look healthy again. Thanks Cynthia! Have you tried them? They are AMAZING! That is so great that the foundation works so well and that you really like it. It would be nice to find one that you really like! we don’t all wake up looking like Beyoncé – wise words, gurl. yikes, i’m not a morning person and i only wear makeup when i feel like it – which is only on special occasion, lol. i even go to work bare face (-_-) i’m too lazy to touch up and wearing make up everyday makes me fear breakouts. yea, sensitive skin is difficult to maintain. Haha Alice! I used to cover my brows with my bangs too but I’ve been wanting to grow out my bangs for a while so I started being obsessed with my eyebrows and taming them! Your makeup look, looks great! I am a firm believer of not wearing too much makeup so I prefer to invest in a few items I know I will love, wear often. Yeah! I only have the products above for my daily routine! You look lovely. Wish I could do my eyeliner like that. I always get it wrong and end up looking like a goth. I really need to invest in some of the anti-frizz oil. My hair is so frizzy even after straightening for ages! 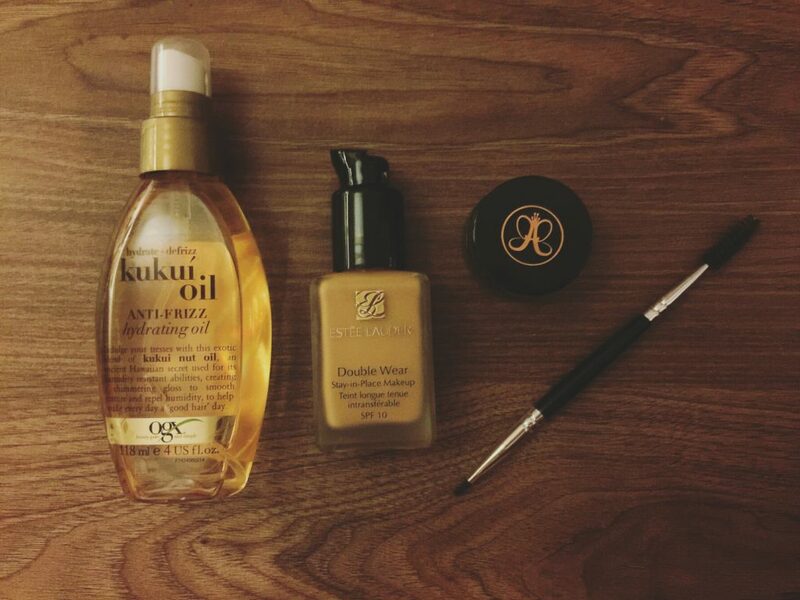 I’ve been dying to try Estee Lauder Double Wear. It sounds like it would be incredible for covering my acne scars. I just need to get saving! My go to product, makeup wise, is my Soap and Glory Thick and Fast mascara. I have a lot of scaring too and Estee Lauder really does hide everything, it’s amazing! Ah, I wish I was a morning person. I’d get so much more done. I guess when I start my new job, I’ll have get used to that. Haha. I should look into use gels because when I get my eyebrows done, sometimes the lady thins it out too much too much on one side, so then I have to fill ’em in. But pencils make it look too drawn for me, too because I have dark eyebrows too. HAHAHA YASSS, LOVE THE GIF! People always ask me how I wake up so early at 6am, I think I’m just weird with an internal clock poking my brain when it strikes 6! 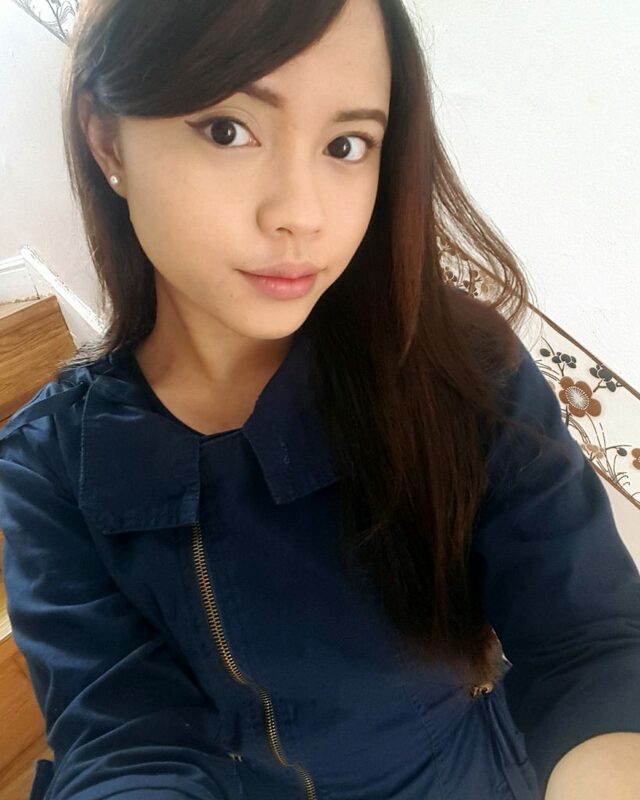 I use SK-II for my skincare, I don’t really wear makeup but it’s nice that yours gives you a confidence boost. 🙂 Looks like you don’t really cake it on like some girls do, which is lovely! I am more of a morning person as well, though in the past year I have had a lot of late nights and my sleeping isn’t quite up to scratch. But, even though I wake up later, I can’t sacrifice my skincare regime haha. I use SK-II serum and moisturiser and sunscreen (I’m lucky because my mum works for them so she gets a tiny discount, it’s small but still better than full price haha). I don’t do anything with my eyebrows but I think they could do with a teeny tiny bit of plucking. My hair is actually quite shiny and silky, even though I have dyed it red, purple, red-purple, blonde, light blonde, light brown, and black – but my fault is my split ends. They are absolutely terrible, and it seems that every time I trim my hair they come back. Or maybe they haven’t all been cut off. 🙁 But yeah, the ends of my hair are ghastly. I don’t do much with my hair in the morning other than brush it and leave it out or tie it up. I’ve not heard of SK-II before! I’ll look into it, I’ve been meaning to change up my skin care routine. Thanks for sharing your list! I’m interested in looking into the foundation and hydrating oil. That’s nice that the foundation feels lighter! I’m very much a night owl and have a lot of issues getting up in the morning. I tend to do the bare minimum in the morning before heading out, haha. I’m trying to look into make-up and beauty products more for cosplay though! That’s one of the few times I’ll spend time on make-up! Youtube definitely is the place to go to – I think that’s where it all started for me xD Especially Michelle Phan, now make up is such a big thing to me it really makes features pop! I would have never thought that your hair was naturally curly! I like how the makeup is a natural tone and compliments you. I try to keep things simple with my to-go products. Makeup isn’t really my thing, so I stick with a simple facial cream from Lush (the $42 one) and a simple lip product to keep it from being chapped :). I LOVE LUSH PRODUCTS! They smell…lush! Hope you are having a great week, girlie. Did you quit that awful job? How did the last day go? How’s Uni this week? Thinking about you and sending you a bunch of hugs! Yeah – the oil is A MUST for frizziness! Ack I wish I could be a morning person! Even when I do manage to wake up early I just lounge in bed until the last minute when I’m scrambling to get out the door, haha. I’ve heard so many good things about the Estee Lauder foundation, I’ll have to try it when my current foundation runs out! Ahh I am loving your beautiful natural look! I bet a lot of people won’t even know you are wearing make up … coincidence that and my go-to products are in my blog post! I used to use concealers instead of foundation until I learned foundations are called that for a reason, hehe. Estee Lauder is a bit outta my budget though, but I can imagine it’s great! I don’t know how much hydrating oil my oily hair would need but that’s a pretty bottle. 😀 And wow, I never thought of using the same gel for both eyes and eyebrows! I recently discovered my liquid eyeliner capless and dried up in my purse, maybe it’s time to try out gel liner!